STEAM AHEAD! DIY FOR KIDS is an amazing book full of hands-on activities. With awesome Science, Technology, Engineering, Art and Math project ideas, it is an easy way to entertain any bored kid! A great way to acquire 21st century skills and STEM learning. Inside this book you will find projects on LED cards, dance pads, handmade soaps, bubble blowers, Play-Doh circuits, cloud lanterns, scribbling bots and more! Awarded 5 stars by READERS’ FAVORITE site, Parents, Educators, Bloggers and Homeschoolers. There is also a BONUS: Material list for STEAM DIY FOR KIDS, to make it easier for parents to plan and prepare in advance. I read this book with my nephew who has recently began to show a very strong interest in the sciences, and I must admit that the book truly turned out to be much better than I expected. In fact, I think I even enjoyed it just as much as he did. What I really admire about the read is that it’s easy to tell early on that the author truly has a passion for educating and inspiring younger readers. The activities are not only written in a clear, easy-to-understand manner, but also with a genuine enthusiasm – which I personally think is a major factor as to why the book was so well-received. As well as this, there’s plenty of different activities to choose from and the actual process of creating and following the steps is almost as fun as seeing the final product itself. To put it simply, I am left more than satisfied by the author and I hope to see more in the future! Sumita Mukherjee, author of the book “Steam Ahead,” offers a great book for creative children interested in working on projects that are not only interesting but also practical. Student projects have run the gamut from hypothesis testing to expanding imagination and creativity today. Sumita provides a step-by-step guide in her book. The material list will save parents a great deal of time accumulating the necessary material for each experiment. This is a must-have book for children that need to create an award winning project for school or any competition. I strongly recommend this book. Wonderful book with fun and science activities. STEAM AHEAD is easy to understand and has got lot of interesting activities for the kids to explore and innovate more ideas. My 7 year old daughter would love to experiment these projects and she wanted to start with cloud lanterns. This book makes it interesting for both the kids and also the adults assisting them. The experiments in the book has got illustrations which is very useful for the kids to understand and follow each and every step. It is a great buy! This book has some great holiday projects for families to do together, some of them best suited to older children and requiring adult supervision. Be aware that for some projects you will need supplies that you don’t have around the house such as LED lights, 3v & 9v batteries and cable connectors. Once you have everything you need, the activities look as though they will be lots of fun and kids interested in science and technology in particular will be able to learn as they create their masterpieces. I’m really looking forward to trying some of these out over the holidays! Very good book! Able to use several activities. 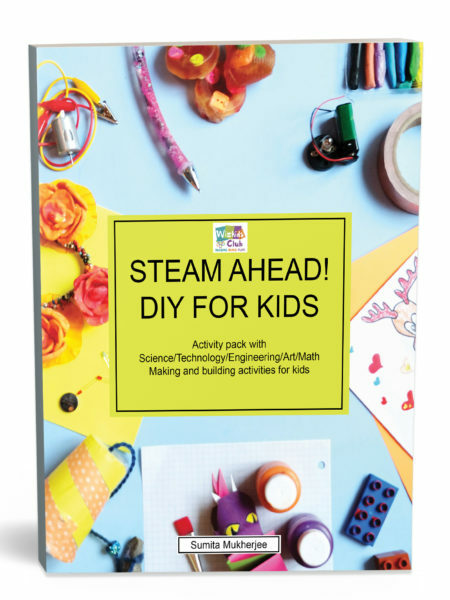 STEAM ahead is an activity workbook for kids focusing on projects that bring together aspects of Science, Technology, Engineering, Arts and Math. Projects are arranged in four sections, the first being projects for a party, the second focusing on building, the third on toys to make and the last on arts activities. Each project features a picture a of the final product, what materials you will needs, a difficulty rating which is explained in the introduction, approximate time the project will take, how it factors into STEAM and step-by-step instructions with pictures of the steps if necessary. I am an informal educator and am always looking for more fun ways to integrate STEAM concepts into lessons. This workbook offers fun, hands-on activities that kids want to do! I do regularly use a few of the projects in class such as Squishy Circuits, Scribbling Bots and Absorption Art, however, the rest of the projects were new to me or things I hadn’t thought to integrate into a STEAM Lesson. So far I have tried out the LED card in class since we have all the material and it worked well with the holidays! I did this project in a lesson about electricity and circuits. The directions were easy to follow and a group of 8-10 year olds were able to understand as we went along. They had a lot of fun designing the card. One thing I do wish that the book would include is a little more information about the science behind each project, if you are not a science educator or have a strong science background, you may not be able to explain to children how exactly the circuit is working. I do look forward to trying the shoebox projector, lava pen and light up dance pad as well. At the end of the book there is a materials checklist for every project in the book, which is handy. I do wish that there was also an index for project by concept such as which projects integrate circuitry, which projects integrate sound, properties of light, etc. On a side note, the e-copy I received had a typo in one of the titles of a project. The Glowing Cloud project is titled Gel Notebook. The Glowing Cloud does look like a super cute Halloween costume to try out! I was lucky enough to get a copy of the book from the author herself. This book introduces simple science experiments to kids. I love the fact that the book is gender neutral. My 5 year old girl would love to try the LED necklace, while my 7 year old son would be thrilled with the lego/ reindeer experiment. All the experiments in the book are broken down into simple easy to follow steps with illustrations. Most of the items listed in the experiments are inexpensive items which can easily be found at the dollar store. STEAM AHEAD is a great book. STEAM Ahead! is a collection of 20 projects based on the STEAM principles of science, technology, engineering, art, and math. The activities are aimed at children ages 4 to 10 and are rated in difficulty level from 1 to 5. The book is divided into four sections: Party, Build, Toys, and Art, and includes a full Material List at the end of the book. This is a handy resource for parents, teachers, and group leaders. With projects ranging from jewelry to robots, there is something sure to please every child. I’m a Girl Guide Leader and will share these activities with my Unit. My favorite activity from each section: Pop-Up Card, Shoebox Projector, Bubble Blower, and Handmade Soap. Suggestions for the author: label the images with the step numbers; provide hyperlinks to YouTube videos of the projects; for the Material List, group materials according to project or list in alphabetical order.